Nicholas Street is in the heart of mediaeval Limerick, with Saint Mary’s Cathedral, dating from the 12th century cathedral, at one end, and King John’s Castle, dating from the 13th century, at the other end. It is possible to walk from one to the other within a few minutes, as I did yesterday before the lunchtime Mozart concert in the cathedral. Between both is a pub that claims to be the oldest in Europe, as well as remains of the city’s Exchange, one of Limerick’s historic almshouses, and the sites of mediaeval churches and townhouses. In any other European city, this quarter would be developed as a mediaeval showpiece, with its important architectural, archaeological and historic sites. 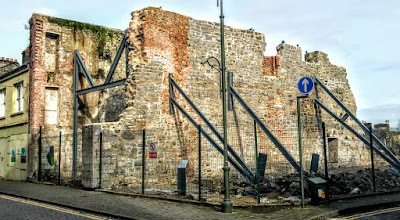 An example, within site of the cathedral, is the corner of Nicholas Street and Saint Peter’s Street, where Nos 36 and 37 Nicholas Street looks like a fenced-off derelict site, but contains the remains of a mediaeval house, including a beautiful medieval stone fireplace. 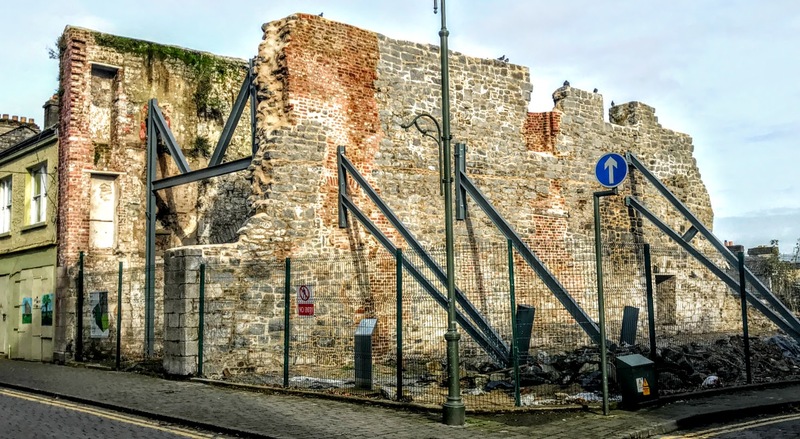 Despite its obvious archaeological importance and its tourism potential, there are regular calls to demolish the ‘Fireplace Site’ in the heart of the city’s oldest quarter of the city. The walls at the site were uncovered some years ago, and are part of a house dating back to late mediaeval times. In mediaeval Limerick, Nicholas Street was the principal street in the heart of the walled city, and at the centre of civic life. The demolition of existing derelict buildings in the area in the 1990s revealed the stone party wall that contains the fireplace and stone corbels that are of archaeological and architectural interest. 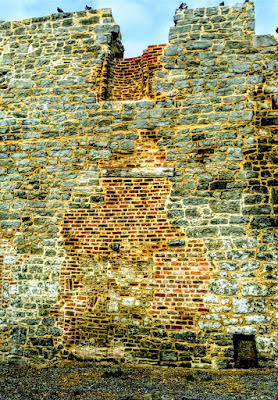 This wall is situated between what were probably two stone mediaeval houses that date back to the late mediaeval or early post-medieval era in the late 15th century. On the north wall is a round-headed doorway with chamfered limestone jambs, while the south wall features the fine mediaeval fireplace on the first floor. The fireplace probably dates from the 15th century, and is decorated with incised relief and floral scrolls. The excavation works also uncovered a mediaeval undercroft beneath the structure. The site also has remnants of the long narrow properties of mediaeval burgage plots that had an average width of five metres. Test trenching at the site revealed further underlying archaeological deposits and a cellar feature. The works at the Nicholas Street ‘Fireplace Site’ include an intricate analysis by archaeological and conservation engineers, mortar testing to establish the correct mortar to be used in the works, and a detailed 3D-laser scan survey. 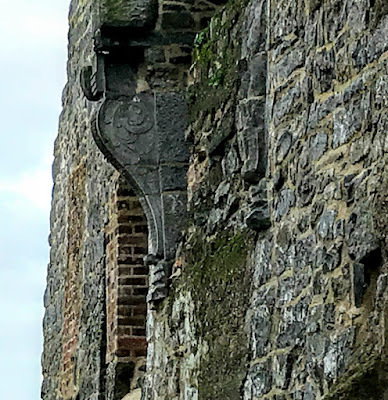 A protective canopy was placed around the entire structure to shield it from the weather as expert stonemasons began the intricate and delicate work of restoring the fireplace and the surrounding structure.